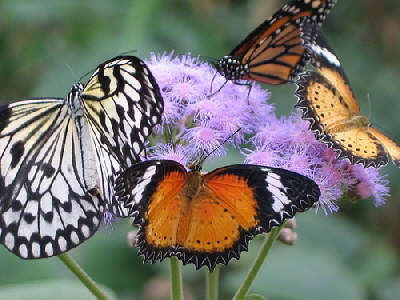 Many plants will attract butterflies if they produce nectar, and many will host the larvae,. These plants are quite commonly known to be attractive to butterflies. Many of these plants will attract a wide variety of butterflies, but listed here are the Butterflies that specifically favor the plant. Achillea attracts the American Copper, Coppers, Hairstreaks and Skippers. Agastache attracts the Red Admiral, Monarch, Painted Lady, Buckeye, Milbert’s Tortoiseshell, Pipevine Swallowtail and Sulphur butterfly. Buddleia attracts the Black Swallowtail, Spicebush Swallowtail and the Anise Swallowtail butterfly. Coneflower attracts the Common Wood Nymph butterfly. Hollyhock attracts the Painted Lady, Gray Hairstreak, West Coast Lady and the Common Checkered Skipper butterfly. Lead Plant attracts the Painted Lady, Red Admiral, Fritillaries, Sulphur and Blues butterfly. It also hosts the larvae of the Dog Face Sulphur. Malva attracts the American Lady, Common Checkered-Skipper, Gray Hairstreak, Painted Lady and the West Coast Lady butterfly. Milkweed hosts the larvae of the Monarch and attracts several butterflies including the Monarch, Edward’s Hairstreak, Banded Hairstreak, Acadian Hairstreak, Gray Hairstreak, Eastern Tailed-Blue and the Great Spangled Fritillary. Butterfly Weed hosts the larvae of the Monarch and attracts several butterflies including the Monarch, Coral Hairstreak, Striped Hairstreak, Edward’s Hairstreak, Banded Hairstreak, Acadian Hairstreak, Eastern Tailed-Blue, Black Swallowtail, Tiger Swallowtail, Spicebush Swallowtail, Baltimore Checkerspot, Checkered White, American Copper, Great Spangled Fritillary, Pearl Creascent and Silver Spotted Skipper. Aster hosts the larvae of the Pearl Crescent and Silvery Checkerspot and attracts several butterflies including the Buckeye, Viceroy, Black Swallowtail, Checkered White, Painted Lady, Monarch Eastern Tailed-Blue Pearl Crescent, American Painted Lady, Cloudless Sulphur, Clouded Sulpher, Common Checkered-Skipper and the Hairstreak butterfly. The Frikart’s Aster also hosts the larvae of the Dog Face Sulphur, Orange Sulphur, Clouded Sulphur and Eastern Tailed-Blue. False Indigo and Wild White Indigo host the larvae of the Dog Face Sulphur, Orange Sulphur, Clouded Sulphur and Eastern Tailed-Blue. They also attract the Orange Sulphur, Clouded Sulpher and Eastern Tailed-Blue butterlfy. Cornflower attracts the Common Checkered-Skipper and the Buckeye butterfly. Pink Turtlehead attracts the Silver-Spotted Skipper, Spicebush Swallowtail Tiger Swallowtail. Shasta Daisy attracts the Painted Lady and the Red Admiral butterfly. Stonecrop attracts the Red Admiral butterfly. Tickseed hosts the larvae of the Silvery Checkerspot Buckeye and the ‘Karner’ Melissa Blue. It also attracts the Buckeye butterfly, Viceroy, Eastern Tailed-Blue, Spring Azure, Pearl Crescent, Orange Sulfur, American Copper and Red Admiral butterfly. English Lavender attracts the Eastern Tailed-Blue, Monarch, Whites and Swallowtail butterfly. Black-Eyed Susan hosts the larvae ot the Silvery Checkerspot and attracts the Great Spangled Fritillary, Silver-Bordered Fritillary, Pearl Crescent, Viceroy, Monarch and Blues. Scabiosa attracts the Painted lady, Red Admiral, Sulphur, Swallowtails and Whites. Goldenrod hosts the larvae of the Baltimore and Silvery Checkerspot and attracts the Monarch, Silver-Spotted Skipper, Clouded Sulpher, Viceroy and Gray Hairstreak butterfly. Coriander, Dill and Parsley host the larvae of Swallowtails. Wild Indigo and Lead Plant host the larvae of Sulfur butterflies. Violets host the larvae of the Great Spangled Fritillary, Variegated Fritillary and Aphrodite Fritillary. Verbena attracts the Great Spangled Fritillary, Zebra Longwing, Swallowtail and the Sulphur butterfly. Bugloss hosts the larvae of the Buckeye butterfly. Cornflower hosts the larvae of the American Painted Lady butterfly. Cosmos attract the Silvery Checkerspot and the Cloudless Sulphur butterfly. Cleome hosts the larvae of the Checkered White butterfly. Lantana attracts the Zebra Longwing and the Tiger swallowtail butterfly. Nasturtium hosts the larvae of the Cabbage White butterfly. Snapdragon hosts the larvae of the Buckeye butterfly. Sunflower attracts the American Lady, Giant Swallowtail, Painted Lady, Gorgone Checkerspot, Silvery Checkerspot, Spicebush Swallowtail, Wild Indigo Duskywing, Sachem and Bordered Patch butterfly. It also hosts the larvae of the Silvery Checkerspot and the Gorgone Checkerspot. Zinnia attracts the Little Glassywing and the Cloudless Sulpher butterfly. Butterfly bush attracts a great variety of butterflies including: Monarch; Buckeye’ Black Swallowtail; Tiger Swallowtail; Pipevine Swallowtail; Comma; Snout Butterfly; Great Spangled Fritillary; Pearl Crescent; Red Admiral; Painted Lady; Common Checkered- Skipper; and Nymphalids. Buttonbush attracts Tiger Swallowtail, Painted Lady and Silver Spotted Skipper. Summersweet Clethra attracts a great variety of butterflies including Swallowtails. Azalea attract the Giant Swallowtail, Pipevine Swallowtail and Spicebush Swallotail. Hydrangea ‘Tardiva’ attracts the Monarch butterfly. Honeysuckle attracts the Giant Swallowtail, Tiger Swallowtail, Spicebush Swallowtail and the Silver Spotted Skipper. Lilac attracts the Pipevine Swallowtail, Monarch, Swallowtails and Nymphalids butterfly. Birch trees hosts the larvae of Tiger Swallowtail, Mourning Cloak and Compton Tortoiseshell. It also attracts the Northern Pearly Eye. Arrowwood Viburnum hosts the larvae of the Hummingbird Moth and the Spring Azure, and attracts the Red Admiral, Baltimore Checkerspot and Question Mark butterfly. Willow host the larvae of the Striped Hairstreak, Red-Spotted Purple, Viceroy, Mourning Cloak, Tiger Swallowtail and Compton Tortoiseshell. Willow also atracts the Mourning Cloak and Northern Pearly Eye butterfly. Cottonwood, Poplar and Quaken Aspen trees host the larvae of the Viceroy, Red-Spotted Purple, Mourning Cloak, White Admiral and Striped Hairstreak. They also attract the Northern Pearly Eye butterfly. Dogwood hosts the larvae of Spring/Sumer Azure and attracts the Snout Butterfly. Hornbeam hosts the larvae of the Red-Spotted Purple. Hickory hosts the larvae of the Banded Hairstreak. New Jersey Tea hosts the larvae of Spring Azure and attracts Spring Azure, Coral Hairstreak, Striped Hairstreak, Banded Hairstreak and Acadian Hairstreak. Hackberry hosts the larvae of Hackberry Butterfly, Question Mark, Mourning Cloak, Snout Butterfly and Tawny Emperor. Serviceberry hosts the larvae of the Striped Hairstreak. Elm trees host the larvae of the Mourning Cloak, Question Mark and Comma butterfly. Spicebush hosts the larvae of Spicebush Swallowtail. Black Walnut hosts the larvae of the Banded Hairstreak butterfly. Tulip Tree hosts the larvae of the Tiger Swallowtail butterfly. Crabapple trees host the larvae of Crabapple Spring Azure, Viceroy Red-Spotted Purple, ant the Tiger Swallowtail butterfly. Cockspur Hawthorn hosts the larvae of the Striped Hairstreak and Red-Spotted Purple. Honey Locust hosts the larvae of Silver Spotted Skipper. Cherry, Plum and Wild Black Cherry trees host the larvae of Tiger Swallowtail, Coral Hairstreak, Striped Hairstreak, Spring Azure, White Admiral, Red Spotted Purple and Viceroy. Witch-Hazel hosts the larvae of Spring Azure. Oak trees host the larvae of Striped Hairstreak, Edward’s Hairstreak and Banded Hairstreak. You can find out which butterflies are commonly found in your area at The Butterfly Site. Many of the common Midwest and Plains butterflies are pictured on the next page with lists of their favorite plants.